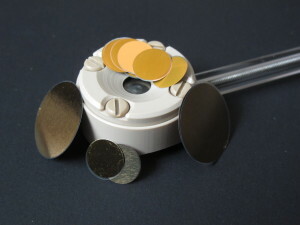 InRedox develops and provides a range of convenient accessories, common supplies, and detailed user guides for using AAO in templated nanofabrication, transport, micro- and nanofiltration, chemical and biological sensing, life science, energy conversion and many other areas of research and product development. 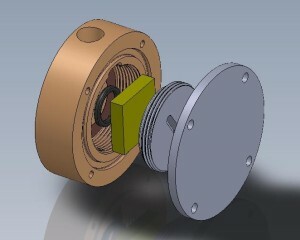 Holders for AAO Wafers with Contacts to assist with templated electrochemical deposition of materials inside the pores. Replacement parts for Electrodeposition Holder (O-rings, contact inserts, screws). COMING SOON: Masking Tape, Electrolyte Solutions, Electrochemical Cells, Counterelectrodes, etc. 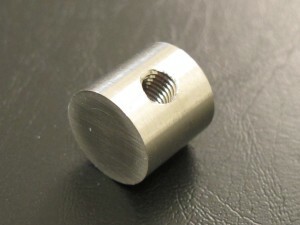 Electrochemical Holder for experiments for that require contact to the front surface of the sample. Used for conductive coatings on insulating substrates, i.e., for anodizing Al films on glass or silicon wafers. If you do not see a product you need, please feel out the inquiry form or contact us directly. All our customers are provided free technical support for use of AAO in their projects. InRedox team includes world-class experts in AAO science and technology.